.Wow was this a fun little novella! The story is nearly all dialog, and while I was reading I kept thinking to myself “All this banter and chatter, this would make a fantastic audio book!”. I hopped online, wondering if there were any reviews up yet of this novella to learn that I live under a rock. Last year, Scalzi wrote The Dispatcher as an audio only novella, to be exclusively offered on Audible.com for a certain length of time. And Zachary Quinto narrates it! As a huge thank you to his fans and everyone who loves audible, the download was free for a short window. 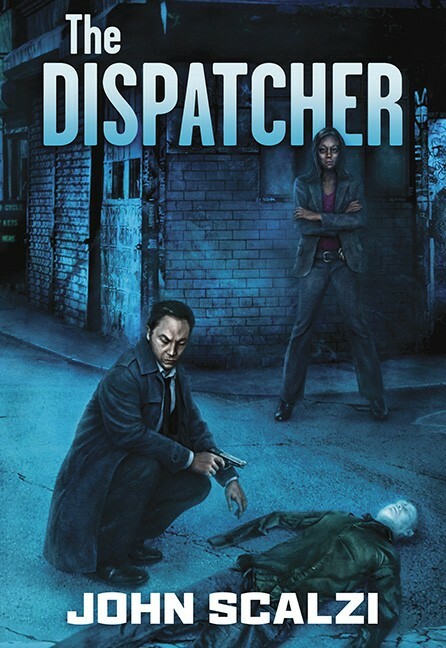 So, I am apparently the last person to know that Scalzi wrote a very fun little novella called The Dispatcher. I’m ok with this. 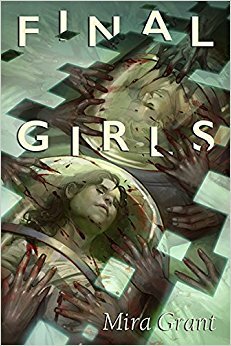 I recently reviewed Mira Grant’s Last Girls, and my experience with Scalzi has been similar to my experience reading Grant/McGuire: I’m mostly meh on their novel length works, but I usually enjoy their short fiction. The Dispatcher is just over 120 pages, but feels much shorter since it is nearly all dialog. The gist of the story is that people aren’t really dying anymore. Sure, you can die from old age, or from driving drunk and wrapping your car around a tree, but if someone else intentionally kills you, you’ll wake up a few hours later at home, as good as new. No one quite understands how or why this is happening, but 999 times out a thousand, it works. What about people who are on the edge of death? They’ve been brought to the emergency room after a terrible car accident, or they had a surgery that had horrible complications? This is where professional dispatchers come in. If you’re about to die, a dispatcher shoots you in the head, intentionally causing your death. About five minutes later, you wake up good as new, at home. About five minutes after that, the dispatcher cashes their check from your health insurance company. It sounds ridiculous, but it works, and it makes for an increasingly fun little story. We have a bottle of champagne still sitting around from New Years, and we’re waiting for a particular special occasion to open it. Do you ever do that with a book? Save reading it for a special occasion or a certain time, maybe when you’re on vacation, or early Sunday morning when the house is quiet, or maybe you’re waiting until the author announces the release date for the next book in the series, or you want to see the movie or the tv show first. I’m curious – if you wait for a certain occasion or event to read a book, what is the book and why are you waiting for that particular event before you read it? I have a third book in a trilogy that I haven’t read yet. It is a completed trilogy, and I’ve been a fan of this author for many years. At first, I told myself I was waiting for the author to announce the release date for their next stand alone novel before I finished the trilogy. Well, that has come and gone, and the new book is getting rave reviews. I still haven’t picked up that third book. Now my excuse is that I want to find time to read books 1 and 2 back to back so I can binge read all three over the course of a week or two. Well, I have the time, and I haven’t done it. I think the real reason I haven’t read the third book is because once I finish the trilogy it will be over. All the lines will have been drawn on the map, the character’s story arcs will come to an end, there won’t be any more exploring to do. If I stay at the end of the 2nd book, I feel like I’m still on the frontier. I can see the end, but it’s a long way off in the distance yet. Next weekend I should really just binge read all three, shouldn’t I? Mira Grant (also known as Seanan McGuire), is famous for her novels and series – the Newsflesh series, the October Daye series, and plenty of stand alones. Having read a small sample of her work, my opinion is that Grant’s talent shines brightest in her short fiction. Her new stand alone novella, Final Girls, can be enjoyed over the course of an afternoon. And trust me, you’ll only need the one afternoon to read this novella, because you won’t be able to put it down. I wrote an entire page of notes just in the first 30 pages of this 112 page novella, and by the time I finished the story, all my notes were irrelevant because the story had twisted and turned in about hundred unexpected directions. Esther Hoffman, a journalist who specializes in debunking quackery, has been assigned to do an investigative report on Dr. Jennifer Webb’s new methods of therapy. Dr. Webb uses dream therapy – her patients read about a horrific scenario in which they face their deepest fears, and then they are put into a hypnotic dream state where they dream the scenario and play it out to it’s conclusion. The person is physically perfectly safe, and a technician watches their vital signs to pull them out if anything dangerous happens. Ideally, the patient learns that they can, and will survive whatever hardships they’ve been facing, and that they can now move on and live a mentally healthier life. At first blush, Final Girls feels like a cross between the movies Paprika and Inception. Except Esther brings plenty of baggage to Dr. Webb’s office, and Dr. Webb is only interested in seeing her name on research papers or a nobel prize. Dr. Webb convinces Esther that the only way she can honestly judge the quality of this new research is to do a session of therapy, and see how or even if it changes her thoughts. As Esther signs the release forms, you can practically see Webb’s ulterior motives in the corner of her toothy grin. Book Reviews coming soon to a review blog near you! and by “a review blog near you”, I mean this one. 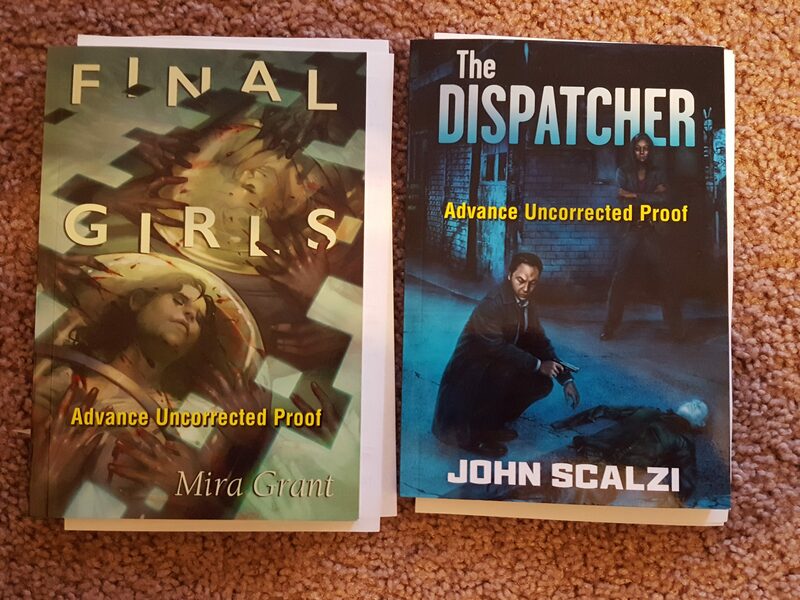 The friendly folks at Subterranean Press sent me Final Girls by Mira Grand, and The Dispatcher by John Scalzi. Both are novellas, and can be enjoyed over the course of an afternoon. Reviews coming soon! I am ever so slowly working my way through Kage Baker’s company novels. Gods and Pawns is a collection of short stories. Lots of Lewis (Yay!!! ), some Joseph, and a smidgen of Mendoza. Every time I see Lewis, I can’t help but picture Cyril Figgis from Archer. 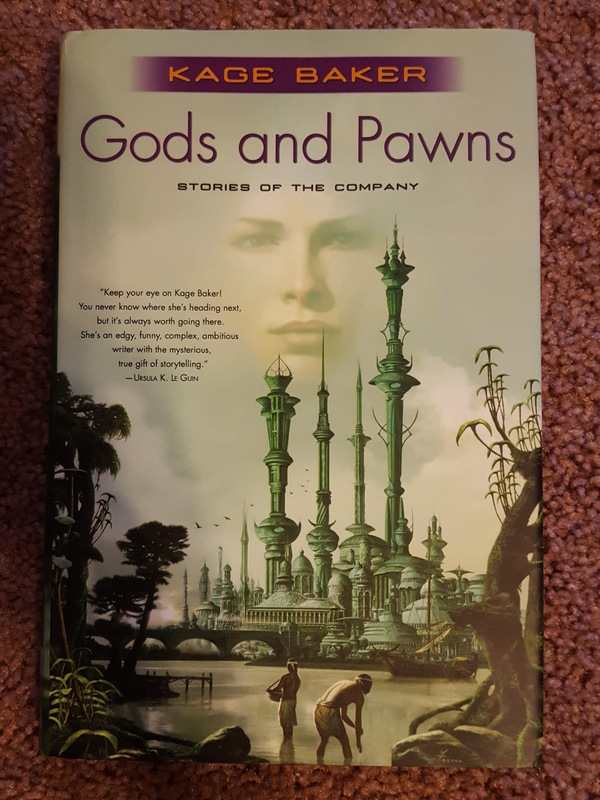 I’d had this book sitting on the kitchen table next to some cookbooks, and hubs said at first glance he thought it said “Gods and Prawns”. that would be a weird but probably good cookbook? 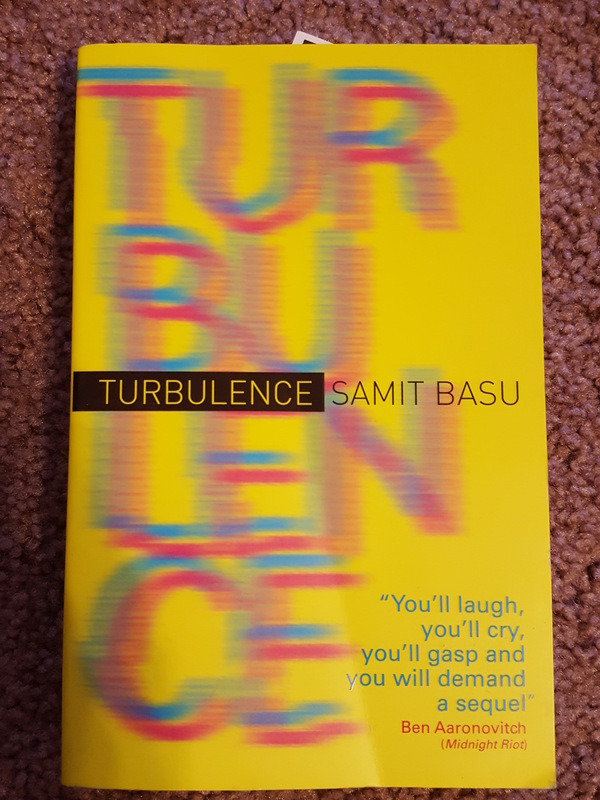 My book I’m reading right now is Turbulence, by Samit Basu. I’d been interested in his superhero novel since interviewing him for SFSignal way back when, so I was excited to come across a copy of this book. It’s hilarious! And engaging! And the characters snark at each other! much fun is being had. Husband said the cover art made him dizzy, I told him that’s what you get for wearing lineless trifocals. Looking at the cover art makes me think I need some red and blue 3-D glasses. Where I got it: received ARC from the publisher. Thanks Subterranean!! These ongoing series are fantastic, aren’t they? 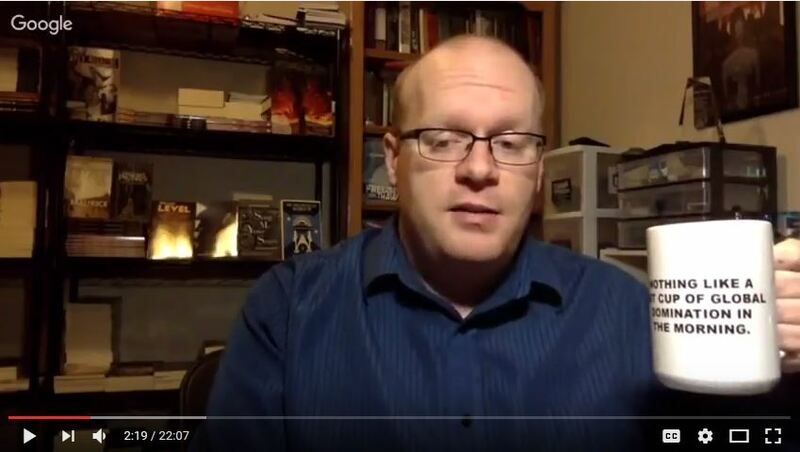 Kevin Hearne’s Iron Druid series, Seanan McGuire’s October Daye series, Jim Butcher’s Dresden Files. You never run out of books to read! On the downside, a huge series like that can be daunting for someone who hasn’t even started it yet. You mean I have to read 7 novels before the backstory starts up? You most certainly do not. Find yourself a short story or novella that takes place in that world as a “dipping your toes in”, as it were. Will you be reading things out of order? Yeah. Might there be spoilers? Yep! But, you’ll get a feel for if this is a world you want to invest more time in. Kelley Armstrong’s first novel, Bitten, came out in 2001, and since then she’s written over 25 novels, primarily supernatural urban fantasy, but also mystery and a few books for kids. Her newest novella, Lost Souls, is part of her Cainsville series, in which people are desperately trying to escape their past and live normal lives. This novella was my first first Armstrong (I know, right? ), and I’m pleased to say I came out of it caring about these characters and wanting to keep their secrets safe. Even better news? 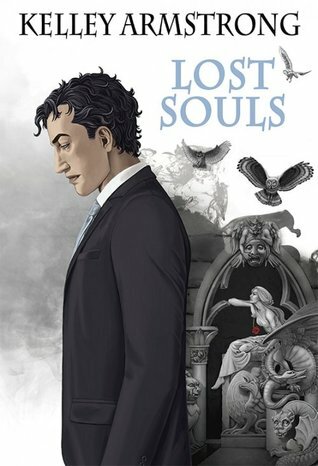 If, like me, you haven’t read any of the Cainsville urban fantasy novels, this Lost Souls is a good jumping in point. Spoilers? Oh,sure, a few. But knowing the future is kinda fun, because when you go back and read the first two Cainsville novels, you’ll feel like you’re in on a big secret that no one else knows. Cold Iron came out in 2015, and it’s been sitting on my shelf ever since. Stina Leicht? Everything she writes is gold, so why did I wait so long to read this one? It is a fat book. It looks like it would take me forever to read, and through all of 2015 and 2016 I had very limited reading time. Did I want to commit to a book that was going to take me a month to read? The cover art screams military fantasy. Yes, I know I went through my Joe Abercrombie phase, but then I realized I was no longer interested in trails of dead bodies. I was no longer interested in stories that glorified battle and killing. The cover art shows a dude with a pistol, looking over a field of battle. Was I going to like this book?? I was hooked in the opening chapter. Nine pages in, and I knew I’d be devouring this novel. A ritual done after a death, swords that carry the memories of the dead. I was happily hooked. And the book only got better from there. Everything about this novel was so wonderful, that I don’t know even where to start. The characters were fantastic, the pacing is spot on perfect, and I loved that Leicht built a fantasy world that exists in a changing world. 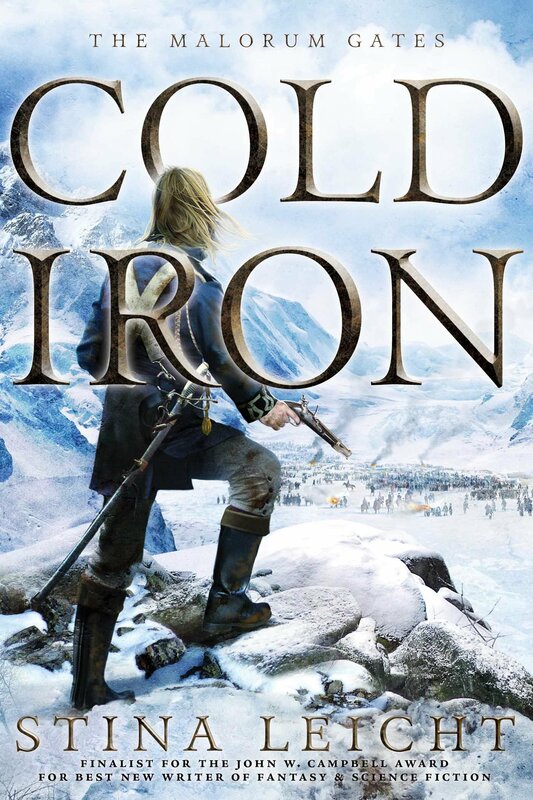 I loved the world of Cold Iron. Leicht created a magic filled fantasy world, one where blood remembers and swords and knives carry memories, a world where water-weavers can control the weather and speak to creatures of the ocean deep. And then she had a non-magical culture (humans!) invade it with muskets and small pox. Yep, small pox. And that’s not a spoiler, by the way. The Eledorians are used to fighting with magic, but how do you magic away a high mortality infectious disease to which no one has immunity?